Menestra is a Navarran dish par excellence. At its heart, it is simply a vegetable stew, featuring the most prized products of the region: white asparagus, chard, artichokes and peas. It´s a staple...you can buy dubious canned and frozen versions in the supermarkets here, which is always a sign of a dish´s ubiquitousness. Another sign? Ferran Adriá's adaptation from a few years back that includes beet foam and almond sorbet. What struck me as strange in the preparation was the three different stages of cooking. First you have the individual cooking of each vegetable. Steaming for the artichokes and bainas and then sauteeing for the chard, cooking them very lightly, just until tender. Later, you must pass the artichokes, chard and bainas through an egg and flour wash, frying them all in olive oil. Only then do you combine all the vegetables in one pot, with the rendered meats and a base of cooking liquid that consists of olive oil, wine, and artichoke liquid. All in all, it's a wonderful example of a classic Spanish stew that uses the best of late winter/early spring's vegetable offerings. 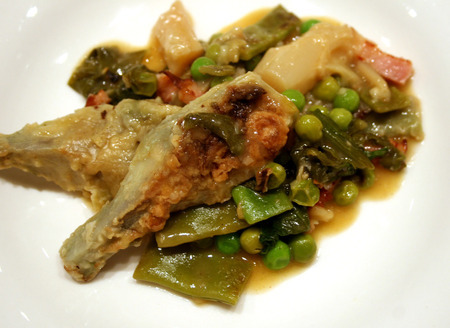 The artichokes from Tudela in Navarra are famous (they are called Blancas de Tudela), but this stew would be delicious made with American produce, too. 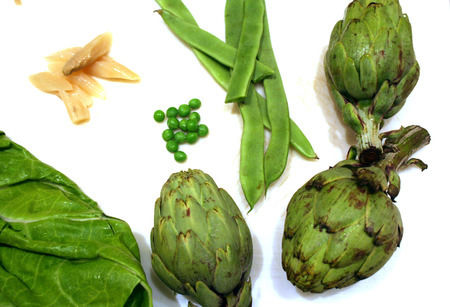 Various versions exist, some of which use fresh artichokes instead of bottled or add cauliflower and carrot. Experiment and find your favorite combination. To prepare the artichokes, trim and steam in 2 cups of white wine and some water (adding a bay leaf, chili, thyme, whatever you like to make it ADAP->As Delicious As Possible). Reserve the liquid. Cut into quarters. Thaw frozen peas in warm water. Sautee chard and baínas (separately) in olive oil until tender. Pass the artichokes through an egg wash then the flour, then cook in hot olive oil until golden. Drain on paper towels. Repeat with beans and chard, tossing the best you can and frying in oil. Messy but important. Next, heat 2 Tbsp olive oil and render chorizo and ham. Then add 1 cup of wine and a cup of the artichoke liquid. Add a tablespoon of flour, stirring well and allowing to cook a bit. Add a pinch of salt, then add the various vegetables, finishing with the asparagus. Bring back to the boil. Add chicken broth as needed, because you want your liquid to reduce a bit but you still want some to scoop up with your bread. Accompany with rosé or red wine.